Despite the recent release of the operating system Android Jelly Bean 4.1, not all devices based on the Google mobile platform, even went to the previous version of the OS, Android 4.0. 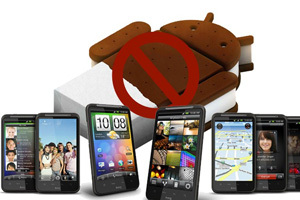 Moreover, even some of the smartphone will never get officially update of Android 4.0 ICS. For example, such a fate befell the HTC Desire HD as says Android Central. After extensive testing, HTC has found that the current version of Android HTC Desire HD provides users with the best operating experience. When we consider the new version of the software, then weigh many factors, but it is crucial to [positive] consumer experience. We apologize if this change has caused confusion among our customers. Hard to say what was the reason for this decision – technical difficulties or financial problems, but now users will have to rely on enthusiasts, unofficially adapting the latest version of Android for different devices, including Desire HD. Already there are a number of alternative firmware based on ICS for the smartphone, but the lack of official support is unlikely to improve the attitude of consumers to HTC.